Piovan, an auxiliary equipment manufacturer based in Italy, will present its new line of dosing units, Lybra, configured for continuous weight-loss gravimetric (LG) or volumetric (LV) operation. Making its debut in Asia at CHINAPLAS 2013, Lybra features high accuracy, advanced control and a particularly straightforward user interface, notes Piovan. The unit can accommodate up to two independent dosing stations, which can even be of different capacities and be retrofitted to meet changing production needs. Each dosing station can be configured for individual capacities in the tens of g/h, up to 170kg/h. Each dosing station comprises a hopper containing the granules to be dosed and is equipped with a proprietary loss-in-weight control to measure the amount of material carried by the dosing screw to the unit’s mixer. The mixture is then continuously transferred by gravity from the blender’s mixer to the plasticizing screw of the molding machine or extruder. The dosing auger is available in three different configurations with single, dual or triple helical shaft for controlling material dosing in low percentages with a high level of accuracy and repeatability. The unit comprises a microprocessor control system with 7” touch screen. A single screen, with intuitive graphical interfaces, allows the operator to control operation of the whole system, compare preset dosing values with actual values, check instantaneous production values and access all the unit’s functions. Connection to external supervision systems by means of an Ethernet or USB port means settings can be downloaded and exported, while it also provides the option of controlling the unit remotely. 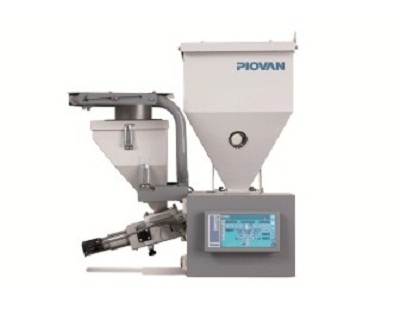 Piovan adds that the unit’s operational versatility makes its suitable for wherever there is a need for frequent production batch changes, which thus entail promptly adapting the operating conditions of each loading station.